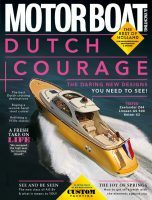 Motor Boat & Yachting columnist, Ray Bulman, turned back the clock yesterday (July 1) when, together with his old powerboat racing colleague, Geoff Tobert, he drove a 40 year old Sunseeker Sovereign runabout he tested for the magazine in February 1970 279 nautical miles from London’s Chelsea Harbour to Calais and back again. With a combined age of 159 years it was probably the last time the pair would drive the Putney-Calais-Putney course over which they launched Class III offshore powerboat racing in 1962. The first race took 11 hours 58 minutes to complete. Yesterday’s passage was almost the same at little more than 14 hours.